Atemberaubende zweistöckigen Hand gehauen Blockhaus mit 3 Schlafzimmern, einem Dachboden und 3 Bäder, einen Whirlpool im Freien, eingebettet unter den Kiefern auf der Rückseite des Mt. Timpanogos, der Heimat von Robert Redford ruhigen und spektakuläre Sundance Resort. Der Essbereich und Küche wurden erweitert und eine neue eigene Küche installiert. Die atemberaubende Küche ist die perfekte Küche und unterhaltsamen Raum. Das Hauptbadezimmer wurde ebenfalls neu renoviert. Dies ist die perfekte Unterkunft für große oder kleine Familien, bietet dieses gemütliche Blockhaus nicht nur einen herrlichen Blick von seiner Rundum-Deck, aber prime Zugang zu den Pisten im Winter Ski und nahezu unbegrenzte Sommer Sehenswürdigkeiten der Gegend. Professionell mit Native American Fotosammlung, antike Möbel, Navajo Teppiche, Körbe und Untersuchungsmaterial taxidermy eingerichtet. Makellos sauber. Highspeed-Internet. Ehemaliges Haus des Hollywood-Berühmtheit. Ein kurzer Spaziergang zu Sundance's Weltklasse-Restaurants, Katalogladen und fabelhaften Annehmlichkeiten und Aktivitäten. Das Hotel liegt im Herzen von Sundance Resort, nur 10 Minuten von Provo / Orem und 20 Minuten nach Park City. Minuten entfernt von Deer Creek Reservoir, Utah Lake, Seven Peaks Resort Wasserpark, Kinos, Restaurants, Fitness-Einrichtungen und Einkaufszentren. Loved the open gathering space! Kitchen particularly was awesome. There were few towels (bring more of your own) and the WiFi didn’t work, but the space was cozy and clean. The address in the listing was incorrect, which made it a little harder to find. Even with a ton of snow, the roads and parking were clear. We’d love to make this our annual hideaway!! Wonderful cabin with great location! 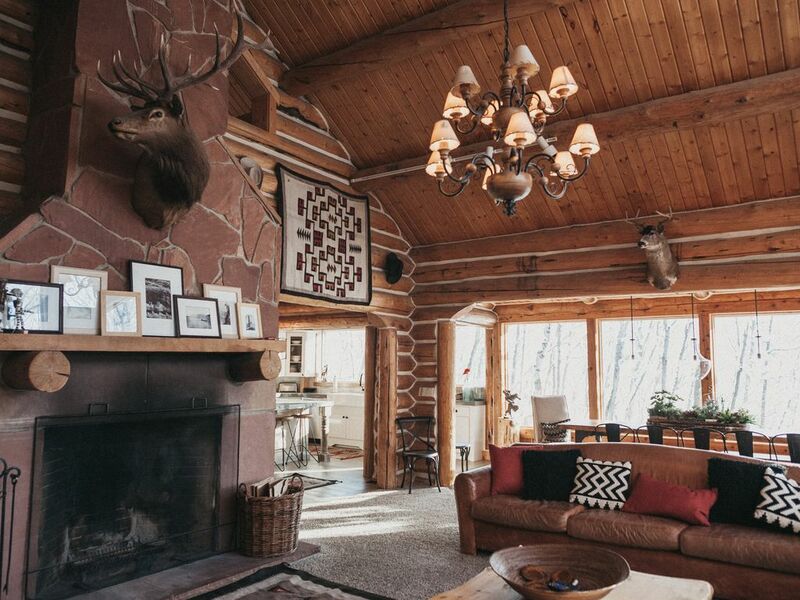 This was a true 'log cabin in the mountains' experience! We enjoyed the beautiful views, secluded feeling (though felt close enough to others if help were needed) and it being very close to the Sundance Mountain Resort (where we Skied and Snow Shoed!). The kitchen remodel is amazing and there was a lot of room for everyone throughout the cabin. This was a great base of operations for our adventures! Lovely quiet cabin tucked away at Sundance. Gorgeous artwork, comfy beds and a kitchen worthy of Instagram to cook in. Owners quickly responded to questions and issues. Plenty of space to spread out and lots of little extra's. New carpet and bathroom linens. We enjoyed spending New Year here! Amazing cabin all around! The only exception was the master bed, which was very uncomfortable. This is a beautiful property, the interior is beautifully decorated. The home is designed to accommodate a family reasonably well. I spoke with the owner on the phone and she was very nice and helpful with the questions I had to ask. The large kitchen and dining area created a nice space for eating and playing games. There are three beds in large rooms with enough storage space for our luggage. The cabin provided all the tech essentials including a washer, internet, and satellite service. The location has a secluded feeling with trees surrounding the property. One thing that could be improved is the cleaning, there was a layer of dust on the light fixtures, shelving, and TV stands that haven't been cleaned for a while. The hot tub is also smelling like mildew and could use a good cleaning. Otherwise the general cleaning of the rooms was done and looked great. Beautiful setting. Great location. Owners very accommodating.